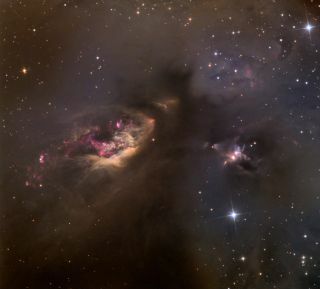 This photo shows the cosmic region known as Sh2-239 and LDN 155, where star formation activity has caused the mix of dust and colors in the nebulas visible here. The deep colors and dark clouds in this image resemble paintings by some of history's greatest artists. "Sh2-239 is my favorite object, because although it is a well-studied nebula, not even professional astronomers have seen it in such detail and in the visible light." Block wrote in an email. The region lies near the southern end of the constellation Taurus, near the border of the constellation Perseus, more than 400 light-years away. A light-year is the distance light travels in one year, or about 6 trillion miles (10 trillion kilometers). The region is often photographed by skywatchers and consists of bright red emission nebulas, star clusters, complex dark nebulas and blue reflected light. The spot is known as a birthplace for stars. A star develops from a giant, slowly rotating cloud that is made up almost entirely of hydrogen and helium. The process creates new stars and releases cosmic dust and gas.